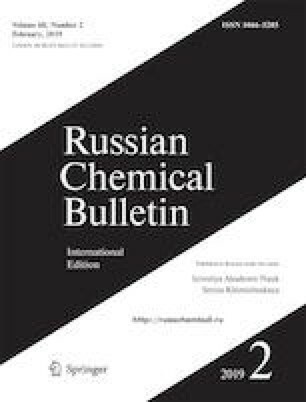 The effects of high hydrostatic pressure, temperature, and solvent on the rates of reactions of tetracyanoethylene (1) and 4-phenyl-1,2,4-triazoline-3,5-dione (2) with 3,4-dihydro-2Hpyran ( 3) were studied. The X-ray diffraction analysis showed that the reaction of compounds 1 and 3 occurs with the formation of the cyclobutane adduct. The reaction is characterized by enhanced entropy and activation volume, as well as a high influence of the solvent polarity (ET) on the rate (R = 0.975). The course of the reaction 2 + 3 differs sharply from the reaction 1 + 3 by the values of entropy and activation volume, the absence of the effect of the solvent polarity on the rate, and the presence of mono-, di-, and trimeric reaction products. Possible routes of these reactions are considered. Published in Russian in Izvestiya Akademii Nauk. Seriya Khimicheskaya, No. 2, pp. 0351–0356, February, 2019.